Mignon Fogarty can't remember whether it was a misused semicolon, a chronic case of comma splicing, or an "affect" when an "effect" was called for, but at some point she had seen one mangled sentence too many. 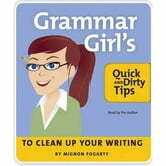 Determined to counter the slipping standards of good writing in daily discourse, Mignon created a weekly podcast called Grammar Girl's Quick and Dirty Tips for Better Writing to reach all offenders—from the intimidated to the apathetic. In less than a year, more than five million Grammar Girl podcast episodes have been downloaded, and Mignon has appeared in the pages of The New York Times and dispensed grammar tips on Oprah. In Grammar Girl's Quick and Dirty Tips to Clean Up Your Writing, Mignon tackles some of the most common mistakes people make while communicating. From "lay vs. lie" and "affect vs. effect" to split infinitives and run-on sentences, Grammar Girl offers clear explanations and effective memory tricks to help listeners write (and say) it right.